The good folks at my employer CommerceKitchen have set up its employees EcoPasses from RTD, aka the Regional Transportation District here in Denver. Since I recently moved to within walking distance of the light rail, I have only driven into work once in the last two months, and having a pass so I don’t have to think about it is both a money-saver. Having grown up in Albuquerque, I have a very long tolerance for traffic, so the light rail is a good fit. Overall, I like riding the light rail quite a bit. However, the usability of the new RTD EcoPass, started in January of 2013, could be much better. 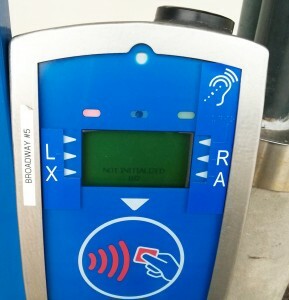 The first problem is that you have to scan your pass at all, which is a bummer when you’re trying to catch a train. The screen is a larger version of those horrible 90s style LED screens last seen on crappy Casio watches that are hard to read in daylight, and the trip options of Local, Express and so on default to different settings depending on the station. The buttons are the kind with horrible feedback, so even when you see the screen change, you feel like you haven’t pushed them. I actively despise the EcoPass beep that happened when you scan your EcoPass. When it works, it makes a double fart. When it fails, it makes a single fart. I apologize to perfectly respectable farts everywhere for that slight. Both sound like scanning didn’t work. How am I supposed to know that when the message flashes up for only an instant, I asked? As someone who used to, in his misspent youth, blip through all 99 analog cable channels, I can register changes pretty fast. After many tries, I have determined that the success message is ECOPASS 12/13/2013. Very helpful. Getting back to the conversation, I pointed out how horrible it was, and with bad “you can’t make this up” customer service instincts, they told me to call the RTD Customer Service number. Not really an update: There is now a sign telling anyone who has problems to call this number now, lest one might think that suggestion is an anomaly. Make the success message display longer. — 1 second would be an improvement. This should be cheap. Fix the sign so it says two beeps. Recently, of the three people that used an EcoPass to get on the train only one person (me) got it right – the other two got one beep. I blame the system, not the people. Make the screens more legible — Probably not cheap, so never going to happen. Make the buttons easier to push — See above. Fix the software that crashed for 3 or 4 days at the Southmoor station, and 1 or 2 days at the Broadway station. I’m not holding my breath on this one. See the “NOT INITIALIZED” image below. For the record, I have used the normal ticket system, and it’s nearly as bad. The screens are more legible, but then you get change in those dollar coins, which is very annoying, and the layout is wonky. I recently purchased a 16GB Nexus 7. My review so far: awesome, a truly great gadget. HD video from Netflix looks amazing. Youtube looks, well, like Youtube. Jellybean (the new Android Operating system) is very nice. Resizable widgets, notifications that are allowed to be longer, overall very polished. It has serious hardware chops. It can run 3D games well, as well as HD video. A $25.00 credit on the Google play is nice. The baby (Matilda) loves the tablet. She likes a fractal program I downloaded, and a wallpaper program that lets you pick a solid color background. It’s hilarious to watch her swipe at the tablet – once she ended up on a page reviewing a local French restaurant, not sure how that happened. Not that I care, but I could not read the free magazines when I first got them. I deleted them, and then an hour later got a patch that basically said, make magazines work on a Nexus 7. I didn’t expect to care about no 3G, but I went to a convention recently and ended up in the bar just to get WiFi since the meeting WiFi was not available. When I first got the tablet (about a month ago) I could not use the home screen in landscape mode. This was annoying since it’s so nice to watch videos on. A recent patch fixed this. I’m not a huge fan of not being to upgrade the SD card, which is part of the reason I picked the 16GB version of the Nexus rather than the 8GB version. New stuff after nearly two months usage: I’m quite happy with the Nexus 7 still. I’m reading Kindle books (or Nook books more recently since the client is better), web surfing, and watching Netflix, as well as the usual Facebook/G+ and Twitter. I had a scare with it not starting up but that turned out to be the wall outlet being funny. There are still some website out there that need to lose their Flash or proprietary video junk, but not many. (And I can use Firefox for Android with Flash installed if I really want to.) I hardly ever use my laptop or desktop anymore. Xcel Energy® has one of the worst bill pay experiences I have encountered in a long time. First off, the actual Xcel Energy® site does not let you pay using your credit or debit card: you must go to a third party site. So what greets you when you first go to this third-party site?. Wow. There are so many things wrong with that. The worst is that it doesn’t know your account number, and you can’t paste it from the Xcel web site because it’s in Flash. (That’s a “feature” for the DRM-lovers out there, I guess.). Also, why is “Xcel Energy” quoted? Then there’s the liberal use of red, implying error when you haven’t done anything yet. Perhaps the oddest thing is that you must scroll to the bottom of the legalese to find the checkbox to check indicating you’ve “read” the text. Once you click the checkbox, the pages submits itself with no warning and a button appears that says “Make a Payment.” This is not reassuring wording, but you click it anyway. In any programming language worth a damn, removing the dashes rather than making the user do it should take 1 line of code. (The same is true of spaces in credit card numbers, BTW). Programmer fail! So you go back and remove the dashes – finally, the website remembers something and leaves the number with dashes in it for you to change. You hit the button with increasing rage. But maybe now that you’ve given it your account number, it will have your information. Nope, you have to pick your state. Gee, thanks. On the next screen, you have to enter ALL of your information. First Name, Last Name, Postal Address, phone, email. Upon entering the zip code, it now “knows” what city you’re in. Except it gets it wrong, using the “default” city for that zip code rather than the smaller city I actually live in. There’s no way to fix the information it “knows”. Next screen, it asks for a payment amount. It has no idea what that actually is, so you have to go back to the Xcel site and copy and paste it. Oh wait, you can’t it’s Flash. Doh! At this point if you’re like me, you say No, to hell with that. I’m using my online banking payment, which has a few issues but at least can remember who I am.